Inventory tasks included conducting a citizen survey to understand the needs of the community. Many areas of the city lacked basic pedestrian and bicycle amenities. Citizens "voted" to help prioritize projects and amenity configuration. 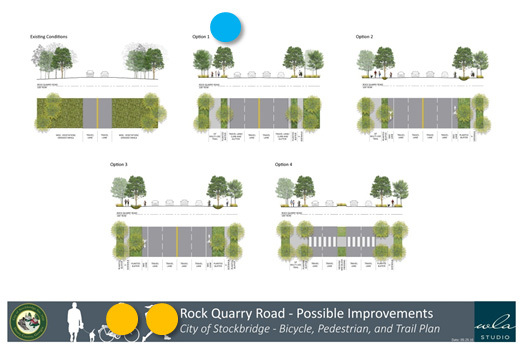 WLA Studio recently completed a Bicycle, Pedestrian, and Trail Plan for the City of Stockbridge, Georgia. This metro-Atlanta city desired a comprehensive plan to address active transportation needs. Studio Director Madie Fischetti and Project Manager Cameron Yates led WLA and a team of community stakeholders in the development of this master plan document. The plan provides details on the existing condition of bicycle and pedestrian facilities in the city and identifies opportunities for future improvement. The plan aims to provide a vision for future connection of existing city assets and links to surrounding county regional amenities. The Stockbridge Mayor and City Council adopted the plan in early January 2017.